Hello and welcome to today’s edition of A Slice Of Soap. There’s loads of time to enter this week’s caption competition so get scribbling and make us all laugh. In today’s news, it’s been announced that the role of Coronation Street’s Nick Tilsley has been filled. Adam Rickitt, who played the part from 1997 to 2004 will be replaced by… Footballers’ Wives star Ben Price! Ben was love cheat Conrad Gates in ITV1’s hit show, starring opposite Laila Rouass who is now appearing in Strictly Come Dancing. 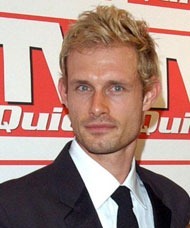 Ben Price is the third actor to take on the role of Nick Tilsley; the part was originally played by Warren Jackson before Adam Rickitt took over. Talking about his new Corrie part, Ben said: "I have been seen a couple of times for Coronation Street characters in the past few years, but I am pleased now that I didn’t get those roles. I am really looking forward to stamping my own mark on the character of Nick." It will be interesting to see this new and more grown up Nick interact with his troubled half-brother David (Jack P Shepherd). I can smell the sibling rivalry from here. Let’s not forget his ex wife Leanne Battersby (Jane Danson) and ex fling Maria Connor (Samia Smith) who will both be around on’t cobbles. According to The Sun, Ben appears in the show on December 21. Can’t wait! What do you think? Is this a good signing? Have your say on Ben Price as the new Nick Tilsley.